Espanya or Plaça Espanya (sometimes shortened to Pl. 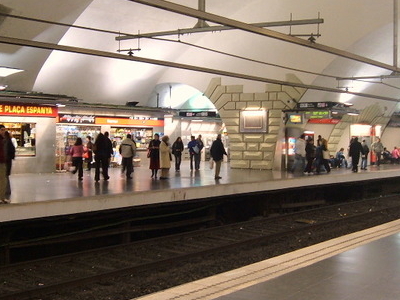 Espanya) is one of the most important stations of the Barcelona Metro network, located under one of the city's largest squares, Plaça Espanya, in the Sants-Montjuïc district. Not far from satellite cities south of the municipality of Barcelona proper, such as L'Hospitalet de Llobregat, Plaça Espanya is one of the metropolitan area's busiest transport hubs, and is linked with a number of day and night bus services in addition to the underground metro and train lines. It was built in 1929 as part of the first metro line in the city, now numbered Line 3, projected on occasion of the 1929 World's Fair, and was closed in 1975, when it moved to a nearby location under the square. The original station was reconverted then into a ticket hall and shopping area, and is no longer used. It is currently served by the already mentioned L3, L1 and L8. The following FGC suburban lines also serve Plaça Espanya: S33, S4, S7, S8. The station appears listed as Barcelona - Plaça Espanya in all the FGC lines (including L8), which use different naming conventions since they cover several municipalities in the metropolitan area and a more detailed location is often necessary. And in addition to these, the following FGC urban cercanías/rodalies lines: R5, R6. Here's the our members favorite photos of "Metro Stations in Barcelona". Upload your photo of Espanya!